“The Hapsburg Variation” by Bill Rapp is an intense mystery set during the Cold War. The novel begins with the murder of an Austrian. Since Austria was occupied by the Allied Powers at that time, the Austrian police ask intelligence officers from all four countries to assist them in solving this murder. The Austrians are afraid that perhaps this murder has political ties and will impede the signing of the State Treaty, which will reinstate Austria’s independence. Karl Baier happens to be an American CIA agent assigned to Vienna. He is also the agent that is requested, by the Austrians, to assist with the investigation. Immediately upon returning home from the scene of the murder, Baier is visited by an unknown Austrian government official. This man urges Baier to keep investigating the murder and to keep a close watch on his wife, who may also be in danger. This visit marks the beginning of Baier’s journey to find the killer. If Baier’s only responsibility through the story was to find the killer, this would still be an action-packed story line. Instead, Baier also has the task of finding his wife, who has been kidnapped by the Soviets. The story hints that the two crimes are connected, but we can’t fully understand if and how they are until the end of the story. If trying to find and rescue his wife, and solve a murder wasn’t enough, Baier must also figure out who he can trust to help him. Each countries’ intelligence agency seems to know more than they are telling him. As Baier travels the European countryside in search of his wife and those responsible for killing the Austrian aristocrat, we are swept inside the world of espionage and intelligence gathering. Rapp has done a fascinating job describing the life of an intelligence officer. This is a story that demands your full attention as you’re reading. It is the second book in a series and I believe knowing the background of the characters and their experiences would have helped me as I was reading this book. That being said, it isn’t necessary to have read the first novel, but it might make this story easier to understand. At times it seemed like the two-story lines were separate and I wasn’t sure how everything would come together in the end. Rapp did a remarkable job creating an ending to this story, while leaving an opportunity for a sequel to be written. 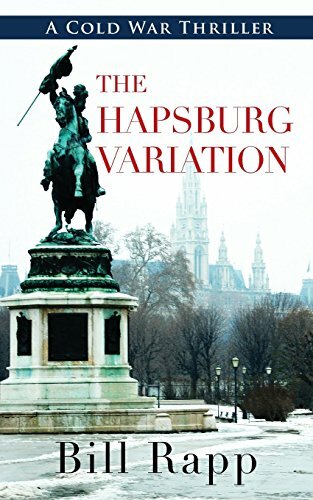 If you are a history enthusiast, I would definitely recommend “The Hapsburg Variation” by Bill Rapp. While, I enjoy history, there were parts of this book that had me re-reading them to make sure I fully understood what was happening from a historical stand point. The book also had me researching to learn more about life in Europe during the rebuilding years after World War II. Rapp is an intelligent and well written author and this book is able to showcase his dedication to crafting a superior historical thriller.